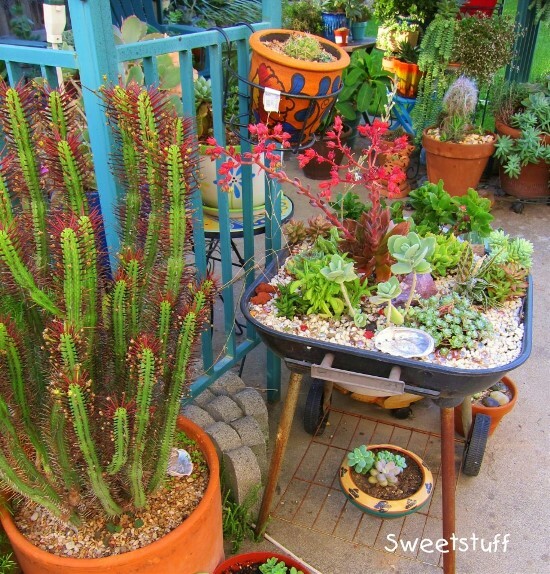 Today’s container garden artisan is none other than the sensational Candice ‘Sweetstuff’ Suter of Sweetstuff’s Sassy Succulents, who is probably best known for upcycling unusual things into succulent stuffed works of found art. No object is safe from Sweetstuff and her playful ingenuity; birdcages, barbecue grills and handmade pottery are all fair game! 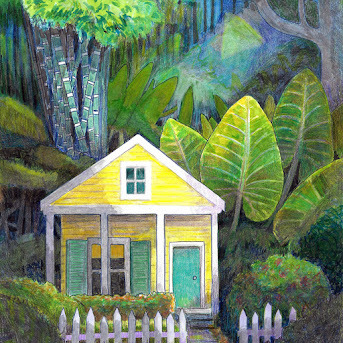 Read on to learn more about Sweetstuff and to take a peek at some of her colorful projects. Sidenote: Appropriately enough, I’m blogging from a jetliner to the succulent-rich city of Phoenix Arizona, where I’ll be participating in Troy-Bilt’s Spring Training Event along with the other five #Saturday6 bloggers. We’ll be visiting Desert Botanical Garden, testing Troy-Bilt products, enjoying fine dining and attending a spring training baseball game! The other bloggers selected this year were Amy Andrychowics of Get Busy Gardening, Matt Mattus of Growing with Plants, Dave Townsend of Growing the Home Garden, Helen Yoest of Gardening with Confidence and Noelle Johnson of www.azplantlady.com. 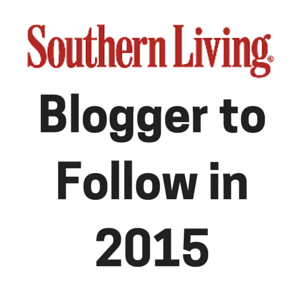 I’m thrilled to be included in such a great group! Now where was I? 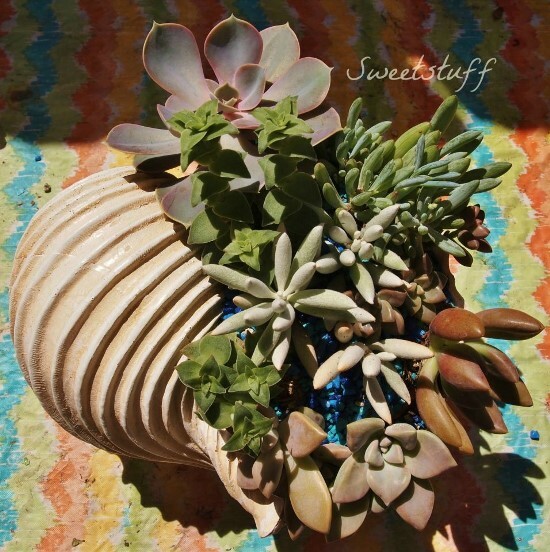 If Debra Lee Baldwin is the queen of succulents, Sweetstuff is their court jester. Her colorful arrangements are pure laughter manifested in physical form; fun and irreverent concoctions made up of plants that anybody could grow... even her. Candice first started growing succulents because they were the only thing she could keep alive, even in her decidedly cooler home of Sacramento California. 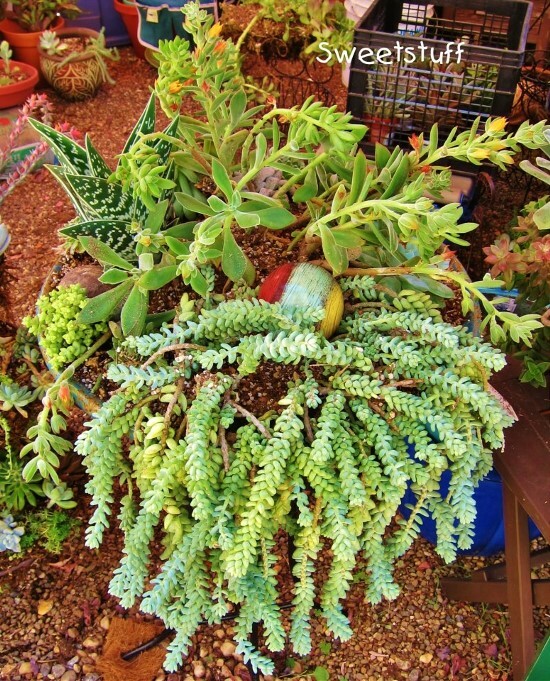 Burro's tail sedum in a pot with... a croquet ball? 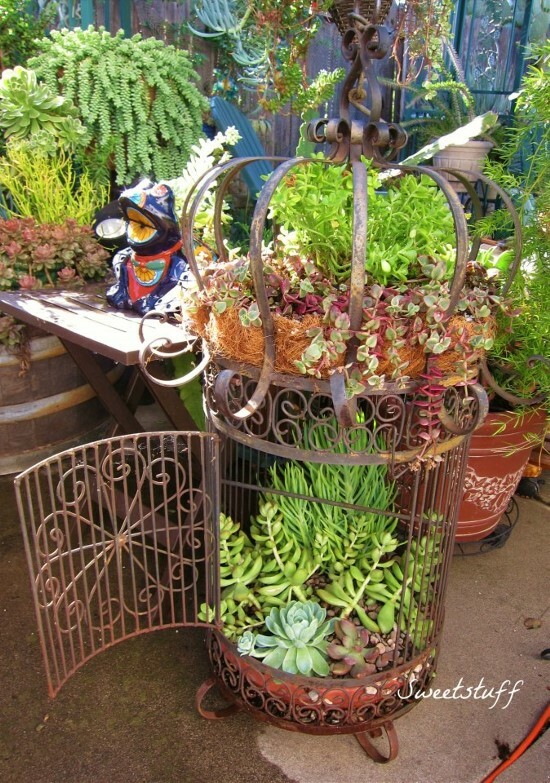 This birdcage belonged to Candice's mother, and reminds her of her love of plants each day. 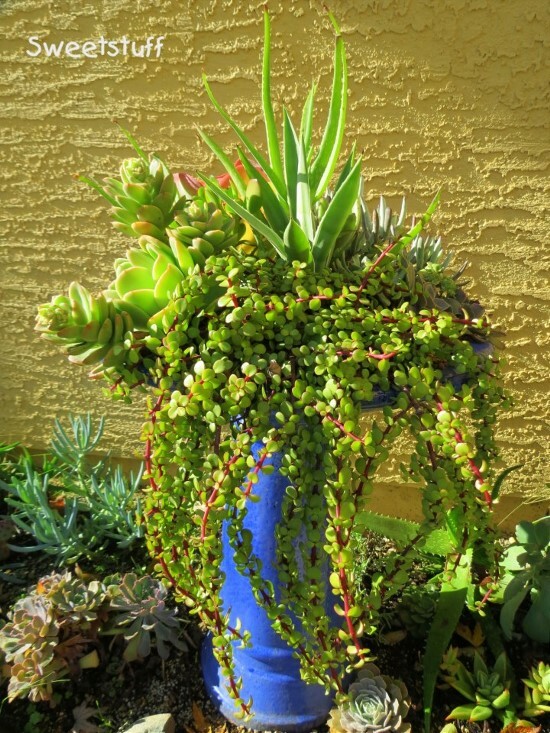 Portulacaria stands in stark contrast to a cobalt blue birdbath. 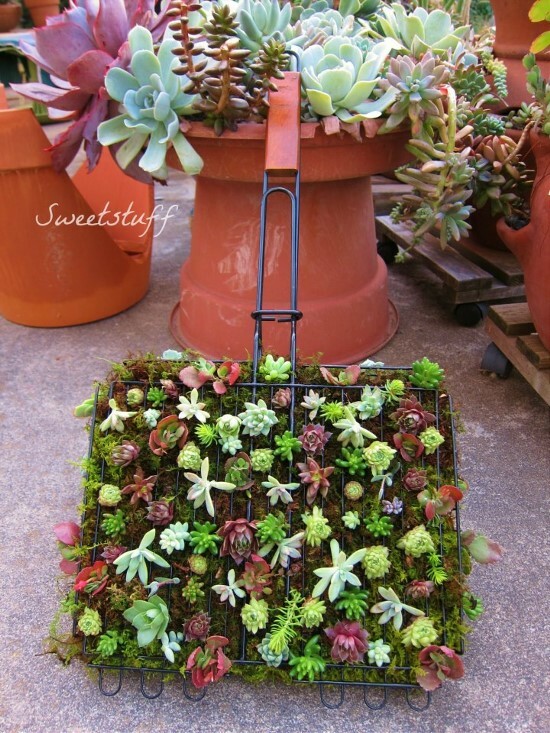 A barbecue grill as a succulent planter: Why not? I would love to see this inventive vertical garden once it fills in! 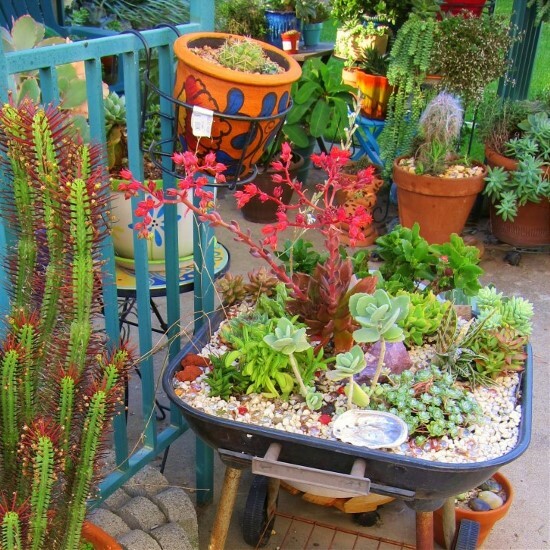 Candice's creations are wonderful examples of how much you can accomplish with succulents in the home and garden, with or without containers. She lives to show others how it's done, and does so via videos on Youtube, blog posts and her Facebook page. Be sure to check her out! Wow you have blown me away! Thank you so much Steve! 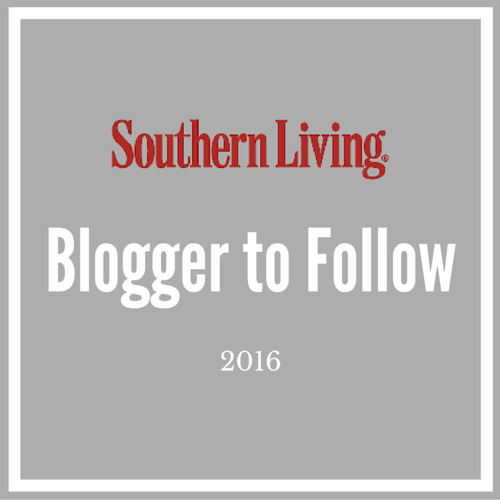 I am so honored to be featured on your blog. 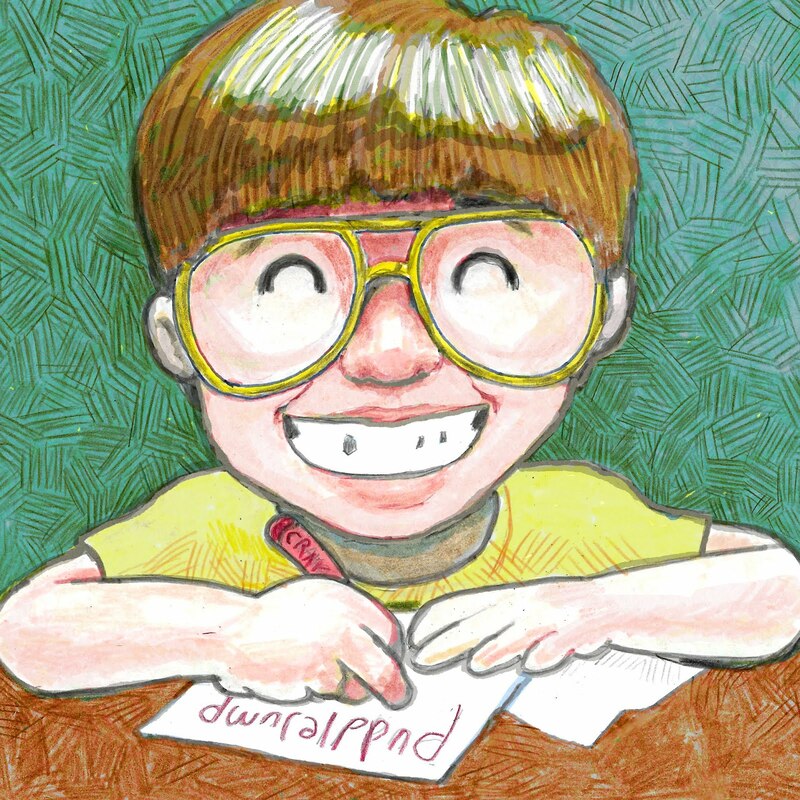 I love what you wrote! Candy is the bomb! She would probably figure out a way to put succulents into that, too! How impressive! I am putting the vertical garden on my to do list. I love the combination of green plantings and art, especially if it involves repurposed materials. Thank you for your post. I love her garden so much! She is amazing. Thanks for sharing! I absolutely loved the birdcage. At first I thought it was a crown ... what a novel piece! Thanks for this post Steve. I knew about Debra Baldwin but not Candice. 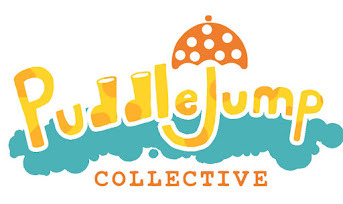 I've already gone to her Sweetstuff Facebook page and signed up!